Pictured: Some of Hawaiʻi’s best doctors, proudly representing JABSOM. Vina Cristobal photo. 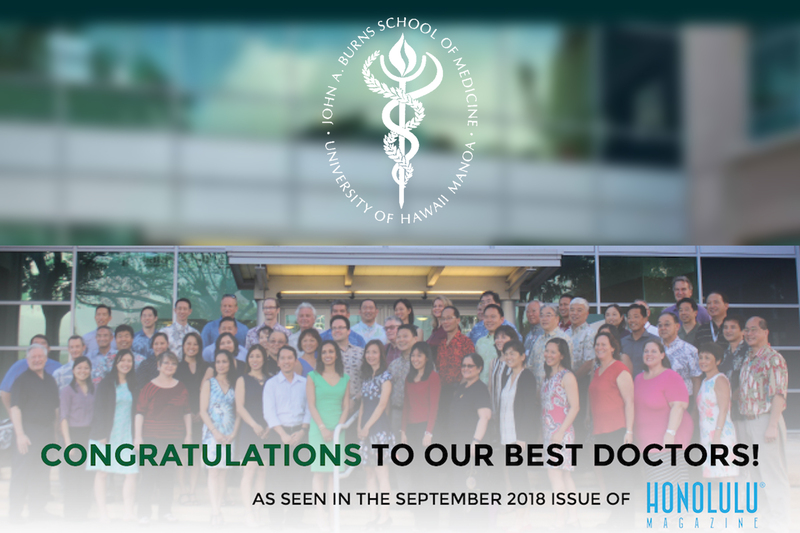 Nearly 300 of Hawaiʻi’s “Top Doctors” are graduates of faculty at the University of Hawaiʻi John A. Burns School of Medicine (JABSOM). The critically crafted list featured annually in Honolulu Magazine starts with doctors who are nominated by their peers, who recognize them as being outstanding in their medical specialties. Doctors do not pay to be selected and profiled as Castle Connolly Top Doctors. Many of the MDs with JABSOM ties were invited to a photoshoot at the medical school for an advertisement, gifted by a gracious donor, congratulating these physicians for high quality excellence in their patient care throughout the state of Hawaiʻi. Watch the very wiki (quick video) from the photo shoot. Castle Connolly Medical Ltd. is a health-care research and information company founded in 1991 by a former medical college board chairman and president to help guide consumers to America’s top doctors and top hospitals. Castle Connolly’s established nomination survey, research, screening and selection process, under the direction of an MD, involves many hundreds of thousands of physicians as well as academic medical centers, specialty hospitals, and regional and community hospitals all across the nation. Castle Connolly’s physician-led team of researchers follows a rigorous screening process to select top doctors on both the national and regional levels. Its online nominations process—located at castleconnolly.com/nominations—is open to all licensed physicians in America who are able to nominate physicians in any medical specialty and in any part of the country, as well as indicate whether the nominated physicians is, in their opinion, among the best in their region in their medical specialty or among the best in the nation in their medical specialty. Careful screening of doctors’ educational and professional experience is essential before final selection is made among those physicians most highly regarded by their peers. The result—we identify the top doctors in America and provide you, the consumer, with detailed information about their education, training and special expertise in our paperback guides, national and regional magazine “Top Doctors” features and online directories.